Welcome to Vanlife Outfitters! I’m Zach and I’ve been a van camper enthusiast for an awfully long time (since the early 90’s). I’ve had a few VW Westfalias, a Eurovan Camper and now traveling with my DIY Promaster camper van. I live in Florida but spend a lot of time in my van and in Panama. I have a background in film/video production and website development. I have always loved to make and create things and generally have more ideas than time. I also love t-shirts and have always wanted some cool shirts about vanlife. So, I decided to make some. I hope you find something you like as well. If you’re an artist or have an idea for some shirts, I’d love to hear from you! 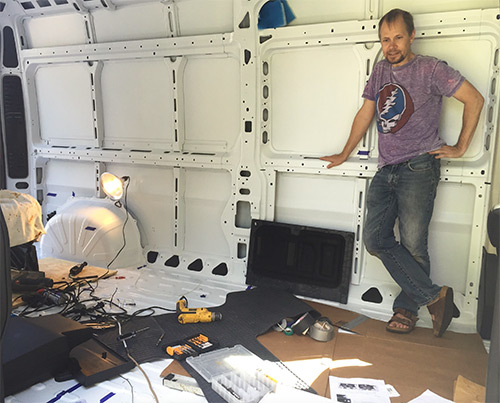 This is me trying to wrap my head around creating a camper van from an empty cargo van in the early days of my build! We’re in a giant car heading toward a brick wall and everyone’s arguing over where they’re going to sit.